Tom Reese: And all that hogwash about horses! The loyalty of the horse! The intelligence of the horse! The intelligence? You know a horse has a brain just about the size of a walnut. They're mean, they're treacherous and they're stupid. There isn't a horse born that had enough sense to move away from a hot fire. No sensible man loves a horse. He tolerates the filthy animal only because riding is better than walking. 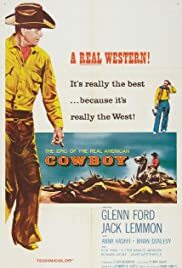 Cowboy (1958) is one of a series of outstanding westerns directed by Delmer Daves that includes the classic 3:10 to Yuma (1957) and the dramatically scenic Jubal (1956). Too bad his body of western work has failed to receive the recognition it deserves. Here he's concerned with de-romanticizing the myth of the trail drive, showing how harsh conditions breed harsh men. Lemmon is well chosen as the cowboy wannabe, worming his way into the rowdy Glenn Ford's trail drive. There he discovers the routine brutalities that help explain behavior as a tenderfoot, he couldn't understand. But in the process he has some civilizing lessons of his own that manage to take hold among the rough cowboy crowd. And whoever thought up that snake twirling episode deserves an award for sheer originality. I've seen nothing like it in years of viewing. Plus the deadly consequences of that witless cowboy fun is put on tragic display in a way that cleverly revises decades of cowboy mythology. To me, it's the movie's brilliant centerpiece. Still, the film is filled with exciting and unusual action, such as the cattle car that could crush a tank, or the pin-the-ring on the angry bull that's more like a test of manhood than a game. No, this is certainly no cliché western. Ford and Lemmon are excellent, especially the latter who's certainly extended out of his usual mild-mannered character. Daves directs with flair and some well-timed tinges of humor. All in all, however, I'm still not sure how to take the movie's overall message even though it appears to have one in mind.